The Travel & Tourism Competitiveness Report just came out. It shows where each country stands today with regards to tourism. Check out pages 356 and 357. Lo and behold: according to the report Venezuelans are the second worst when it comes to friendliness towards tourists. Only Bolivians are nastier, Russians are just as nasty. This doesn't surprise me at all. On one side you do have lots of people who would go the extra mile for tourists, as few would in many other countries. On the other side, you have a large amount of people who are trying to rip you off or haven't got any idea about customer service or who harass you in the crudest way if you happen to be a woman. Things have got worse and worse. Last time I was in Venezuela I was prevented from using the luggage trolley within the general area. A "luggage transporter" told me now only he could use it (and I would have to pay). I went with a female friend who was harassed half of the time she was alone. She wasn't dressed in any provocative form and she has a good command of Spanish. She just looked "European". Another friend told me how Venezuelans kept asking her about sexual habits in Europe...a little bit of an obsession, it seems. Ripping off tourists is something widespread but Venezuelans are trying to excel on this. Is it perhaps because of the cargo cult so prevalent in Venezuela? Because of the politics now? Venezuela does very good when it comes to things we didn't have to do ourselves: nature. Even that we are trying to destroy, as anyone who has been to the Morrocoy National Park or to any beach in Venezuela or to Gran Sabana can attest: people litter everywhere and they would stare at you without understanding what you say if you call their attention to that. Blackouts are our daily bread. Service is dismal. 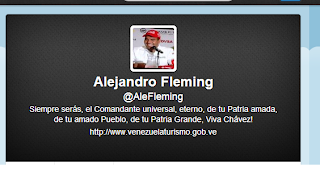 Come on, minister Fleming, tell us how wonderful Venezuela is for tourists. 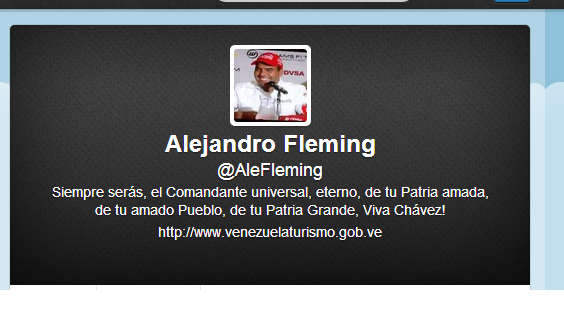 Twitter account of the minister "of the Popular Power for Tourism". I try to translate: "you will always be, the universal Commandant, of your beloved Fatherland, of your beloved People, of your Big Fatherland, Long Live Chávez"